The game of blackjack has very simple rules. The main goal of the game is to reach 21 or close to 21 without “busting” or going over. The game is played against the house or the dealer not other players at the table. 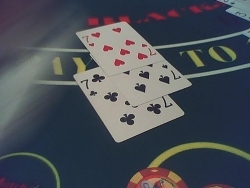 In movies and television shows, blackjack is shown to be a really vulnerable game due to Blackjack Card-counting strategies. In the movies, people are shown that card counting is skill that can be learned easily in a short amount of time. In the real world, this cannot be farther from the truth. You can try to play blackjack switch game to experience something new in gambling. Winning large amounts of money with a perfect Blackjack Card-counting strategy isn’t really something that is possible in a short amount of time. Even when card counting is done perfectly, it still isn’t the ultimate method that will allow blackjack players to rake it in. The best card counters in the world of gambling can’t even manage to break the 1% advantage over casinos. This is really far from the mythical notion that is generated by movies which seem to show advantage of more than 20%. In the real world, profits are really peppered with a lot of downswings and losses. Learning the best card counting strategies in order to gain an advantage in blackjack can’t be learned as easily as they are shown in the movies. When players decide to learn card counting for profit, they should be in for a lot of hard work, study and practice. The card counting system requires patience, practice dedication and a lot of math skills to learn. Most of the gamblers that decide to learn card counting for blackjack actually quit in the first few days because they neither have the time nor the true dedication to learn the method. Players who are dedicated enough to really train and practice in order to learn the secrets of card counting should first try it by themselves. They can do this by dealing cards by themselves and counting. With consistent practice, these gamblers will then be able to keep track of counts with faster deals and more decks. The card counting strategy not only requires that a player have a great memory, it is also dependent on the “coolness” of the player. This is tested right at the casino setting. A player, who is dedicated in learning card counting, should stay at the casino for hours on end watching and counting even when he is not playing a game. The next step to consider, when learning card counting skills, is the actual size of the bankroll that the players are actually going to play with. Even with a perfect set of card counting skills, a player will still luck out if he doesn’t play with enough cash. This is because the luck of the draw will usually swing wildly during any given night. A good blackjack player using the best Blackjack card-counting strategies needs to play with at least $25,000 in order to ride the swings to profit and victory. Can not imagine your life without the game of blackjack? Welcome to the website where you can easily find and read everything concerting your favorite card came, learn its history, discover all blackjack games, their rules, strategies and secrets. Enjoy reading and discovering the world of blackjack for yourself: best online casinos, interesting articles about blackjack professional players, great chance to play blackjack online and get a pleasure from this noble and exciting card game. Which blackjack idol had made a major contribution to blackjack's development? Copyright © 2019 BlackjackIdols. All rights reserved.